Generally, officers are not notified by the NOPD that there is an active internal investigation. Most of the time, officers find out that they are involved in an internal investigation when they receive a letter from Civil Service about an extension hearing or they receive a Notice to Render Statement. 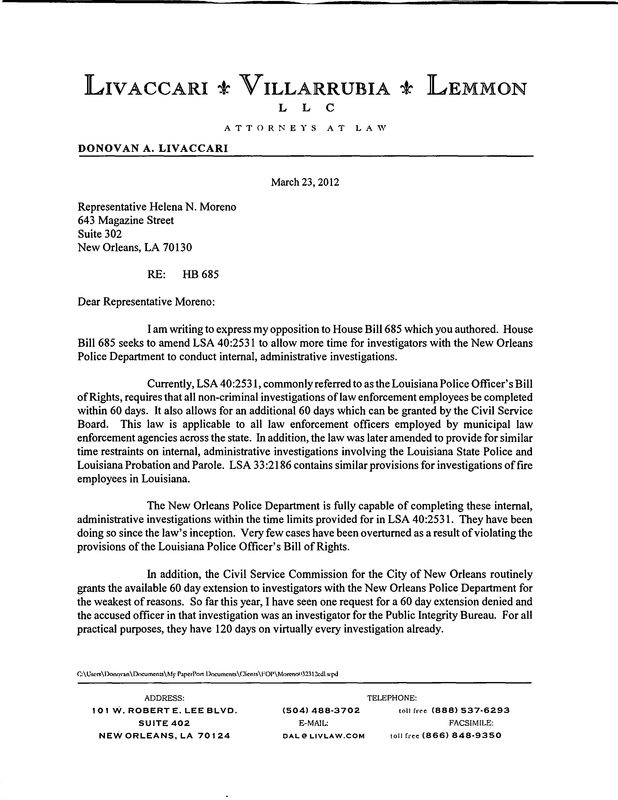 The Louisiana Police Officer’s Bill of Rights (LSA 40:2531) requires that administrative investigations be completed within 60 days. The Department has the option of requesting an extension of up to an additional 60 days from the Civil Service Commission. NOPD investigators routinely request the extension in almost every case. Once the investigator requests the extension Civil Service generates a letter to the officer notifying them of the upcoming hearing. The letter from Civil Service informs the officer of the PIB Control number, the date and time of the hearing, the identity of the hearing officer, and the location of the hearing. Receipt of this letter is often a surprise to officers. The letter also informs the officer of the right to have counsel and that the hearing will not be continued. If you receive one of these letters, you should contact your FOP attorney, if you have not already done so. If you have already contacted your FOP attorney regarding the investigation, you should still contact your attorney and advise him of the upcoming hearing date. Your FOP attorney can appear on your behalf at this hearing. An officer is not required to appear at an extension hearing. If the officer does not appear and does not have an attorney appear on his behalf, the extension will simply be granted. The officer also has the option of having his FOP attorney appear on his behalf. Of course, an officer can attend the extension hearing, if he is so inclined. What happens at an extension hearing? The only issue under consideration at an extension hearing is whether or not the investigator has shown “good cause” for the extension. The facts of the investigation or the propriety of the officer’s actions are not an issue under consideration at an extension hearing. Generally, the investigator is the only person who testifies. The officer or his attorney can ask some limited questions relative to the need for the extension or make a statement with regard to the need for an extension. Again, any questions or statements are relative to the need for an extension. It would not be relevant to ask the investigator about the statement he took from the complainant or a witness. Once the investigator has testified, the hearing officer makes a recommendation to the Civil Service Commission as to whether or not the extension should be granted. The officer usually receives another letter in the mail form Civil Service which informs the officer that the hearing officer’s recommendation is to be presented to the Civil Service Commission for ratification at their next regular meeting. Generally, there is no testimony at this meeting relative to extension requests The Civil Service Commission merely considers the recommendation of the hearing officer and then ratifies it as its own. Again, an officer who receives such a letter should notify their FOP attorney so that the attorney can appear on his behalf. Sometimes, an officer learns of an open DI-1 when they receive a Notice to Render Statement from the investigator. Sometimes this form is delivered by email or through the officer’s admin officer. The Notice to Render Statement form contains several important pieces of information. At the top of the document, the form lists the investigator’s identity as well as the charges being investigated. The form constitutes a written order to appear at a specific location on a specific date at a specific time to render a statement. The location, date, and time can also be found on this form. If you receive one of these forms, you should contact your FOP attorney if you have not already done so. If possible, you should forward a copy of the Notice to Render Statement form to your FOP attorney. By law, you have up to 30 days to secure representation. However, it is important to make contact with your FOP attorney as quickly as possible. What you do not want is for the date to render a statement to come and go without making contact with the investigator. If the statement date is inconvenient for one reason or another (AWP, furlough, etc. ), it is usually possible to reschedule. Your FOP attorney will discuss the actual statement with you in greater detail with your specific case in mind. The form also lists numerous other things that you can be ordered to do. For example, you can be ordered to take a CVSA, take a urinalysis, or stand up in a physical lineup. These things rarely happen. 99 times out of 100, all you would be required to do is render a verbal statement. You can contact me directly at 504-905-8280 or DAL@LIVLAW.COM. The link to this article is http://wp.me/p2fTzd-aU. Feel free to share it with your fellow employees. The Crescent City Lodge of the Fraternal Order of Police provides its members with an outstanding legal plan. 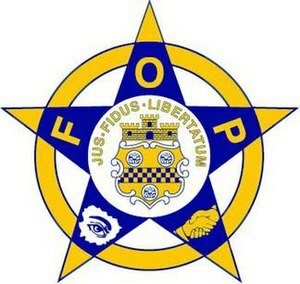 The FOP Legal Plan provides an attorney to any member who is the subject of an administrative or criminal investigation. It will also provide an attorney if you become the defendant in a civil law suit arising out of the course and scope of your employment. But wait, there’s more. . . The FOP Legal Plan will also provide you with an attorney if you are a witness in an administrative or criminal investigation. The FOP Legal Plan will provide you with an attorney if you become the subject of an administrative or criminal investigation because of an incident that occurred while you were off-duty. The FOP Legal Plan will provide you with an attorney for any Civil Service appeals or other Civil Service matters. If the matter warrants action beyond the Civil Service Commission, the FOP Legal Plan will provide an attorney for appeals through the court system. The FOP Legal Plan provides complimentary notary services. The FOP Legal Plan will pay for the first two hours of legal services for ANY personal legal matter. Finally, the FOP Legal Plan will reimburse you for up to five suspension days if you choose not to appeal (you have to be represented by an FOP attorney to qualify). These are benefits you pay for every other week by payroll deduction. You should take advantage of these benefits. **PLEASE NOTE that the above specifically relates to the FOP Legal Plan as administered by Crescent City Lodge #2. 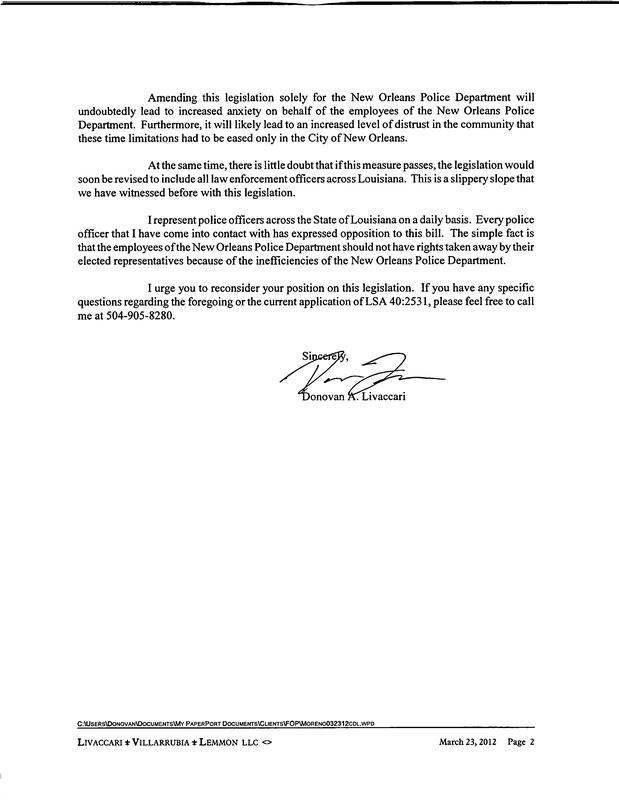 Certain benefits, such as the two hours on any personal legal matter, are not available through the National Legal Plan and may not be available to members employed by agencies other than the New Orleans Police Department. If you have any questions and are not employed by the New Orleans Police Department, please call me or the FOP Legal Plan at 1-800-341-6038. What types of investigations should I call about? People frequently tell me that they did not call, or were not sure if they should call, because the investigation seemed minor. It is as if somehow this minor investigation would be an imposition on the attorney. Nonsense. Wouldn’t you use your health insurance for the most minor appointment with your doctor? In addition, you need to be represented by an FOP attorney in order to qualify for the Salary Reimbursement Option (SRO). You don’t need to have “something to worry about” in order to call. Immediately. You should call as soon as you learn that you are either an accused or witness in an administrative or criminal investigation. You should also call if you receive a letter from Civil Service about the department’s request for an extension of time. Also, it is almost never too late to call. Just because you didn’t have an attorney when you made a statement doesn’t mean you don’t get an attorney for the disciplinary hearing or the Civil Service appeal. Finally, you should call if you have any question about an investigation or the process of conducting these investigations. If you know one of the FOP attorneys, you can call that person directly. If you do not know who to call, you can call Jim Gallagher at 504-442-4050. You can contact me directly by email, phone, or text. The Louisiana Legislature is set to convene on March 12, 2012. One piece of legislation of particular interest is HB 685, authored by Representative Helena Moreno, which is an attack on the Louisiana Police Officer’s Bill of Rights. HB 685 would change the provisions of the Police Officer’s Bill of Rights. In particular, the legislation would change paragraph b(7) which governs the time limits for administrative investigations only for the New Orleans Police Department. Currently, La. R.S. 40:2531(b)(7) requires that administrative investigations be completed within 60 days. The appointing authority can request an additional 60 days, for a total of 120 days to complete an administrative investigation. These time limits do not effect criminal investigations. The proposed law would change the 60 days allowed to complete the investigation to 120 days and still give the department the option to request an additional 60 days for a total of 180 days. Again, this legislation specifically states that the change would only be applicable to the New Orleans Police Department. Those people in other parts of Louisiana should not get too comfortable. If history tells us anything, this legislation will be implemented state-wide next year if it is passed for New Orleans this year. I urge all of you to contact your elected officials and tell them that you oppose HB 685. If you don’t know who your elected officials are, click here. For information on members of the Louisiana House of Representatives, click here. For information on members of the Louisiana Senate, click here. I would like to encourage everyone to contact Representative Moreno and let her know that you are opposed to this legislation in addition to contacting your elected officials. You can click here for Representative Moreno’s information. Please remember that Representative Moreno came to the Fraternal Order of Police during the election looking for support from our members and pledging to assist us in Baton Rouge.